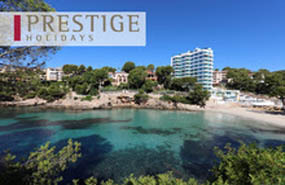 Luxurious with cutting edge design and premium services, this is an exquisite ‘adults only’ boutique hotel, perfectly located in a quiet residential area and on a pretty sandy cove, yet only a short distance from the exclusive marina of Puerto Portals. Superb gastronomy and a fully equipped Wellness & Beauty Centre including a 650m² BioSpa as well as a personal butler service endorsed by the British Butlers’ Guild complete the picture. The aim here is for you to leave feeling thoroughly pampered and completely relaxed. 6 spacious rooms reflect the unique style of the Dutch designer Marcel Wanders, who is renowned for his iconic interior design. Apart from executive and penthouse doubles, there is a selection of exclusive suites to tempt the senses, from the Heritage Suite, the Naughty Suite, the Games Suite, the Spa Suite and the Stargazer Suite. 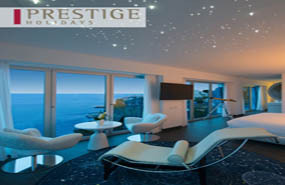 The Stargazer Suite is the perfect place for an astrological tour into outer space and there is even advice on hand by the Mallorca Institute of Astronomy and Aeronautics on how to enjoy the most amazing astronomical events. Apart from professional equipment including a CPC-800 catadioptric telescope and a fascinating selection of astronomy books, you can sleep under a Swarovski starred constellation ceiling. The Stargazer Suite’s balcony is the ideal place for showing guests how to spot the stars visible in the sky over Puerto Portals – 60 minute sessions guided by experts are free of charge to hotel guests.